Ocean Alexander Yachts is based in Kaohsiung, Taiwan and the United States, and was founded in 1977 by Alex Chueh along with naval architect Ed Monk Jr. Using 3D modeling to engineer its yachts, the yard utilizes building materials such as featherweight unidirectional carbon fiber, and aluminum I-beams that are 10-times stiffer than wood or fiberglass. Attention to detail is seen in the company’s use of high-tech sound insulation to reduce engine noise, and make the ride more relaxing. Ocean Alexander also builds its own fuel tanks with military-grade aluminum alloy, the same used by military vessels, demonstrating the company’s commitment to building a high-quality product. Additional details can be seen in its well-known oval-shaped handrails that add distinction to the brand. World-class builds by Ocean Alexander Yachts include the 155’ (47.24m) Ocean Alexander 155, the 90’ (27m) MISS MICHELLE, the 108’ (30m) JELLY BEAN, and more, with design by some of the top stylists from around the world, including the renowned Evan K. Marshall. Browse the entire fleet of Ocean Alexander yachts for sale or find an Ocean Alexander yacht for charter below. Interested In Ocean Alexander Yachts? 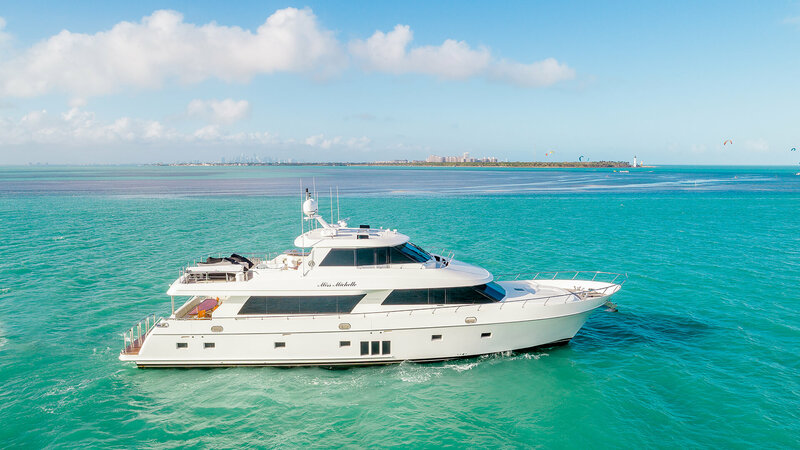 For more information about Ocean Alexander yachts for sale and your own custom tailored yacht report, or to book a Ocean Alexander yacht for charter, simply contact the Merle Wood & Associates luxury yacht brokerage firm.